We invite you to learn more about the 2019 spring vineyard conditions from Joseph Phelps Viticulture team members Carol Wilson Millerick (Napa Valley) and Jeff Baccus (Sonoma Coast). How much rain have we had this season? How does that compare to an average/normal Napa Valley and Sonoma Coast rainfall? Carol Wilson Millerick: 2019 is well ABOVE average compared to the last 7 years at the onset of spring. Banca Dorada received the most and Suscol the least amount due to storm directions and the influence of the Mayacamas Mountains. Jeff Baccus: Unlike Napa, rainfall in Freestone is currently at 43.65 inches. The historical annual average for Occidental, CA from WRCC (western regional climate center) is 54.29”. Rainfall totals have varied widely in Sonoma County. Given the wet winter we’ve had, how does this affect vineyard work and tools or equipment needed for our workers? CWM: Pruning is delayed and can lead to a later start of the season (delaying bud break). Mowing and the chopping of canes is also delayed. The wet/saturated soils are vulnerable to compaction. It is very important to mow the cover crops in frost-prone areas to protect the delicate shoots after bud break. JB: Saturated and muddy soils increase soil compaction from tractors so we will be minimizing early tractor passes. How will the wet winter affect vineyard practices during the early growth of the vine? What additional practices are needed? CWM: Wet winters tend to have increased vine canopy growth. We need to minimize too much growth too soon. A balanced canopy allows the vine to focus its energy on developing the grape and minimize the amount of passes in the vineyard to remove excessive shoots. Depending on the location, this will require more passes to achieve a desired canopy size. JB: If the rains were to stop today, we would be set up perfect for the upcoming year. No need for early season irrigation as the soil profile is full. Cover crops may get to hang out in the vineyard rows longer to dry down vineyard blocks before mowing or cultivation. Why do we sometimes see overhead sprinklers running right after a day of rain when the ground is already wet? CWM: To ensure that our lake doesn't overflow. You will see this occur in other ranches around the Napa Valley after heavy rain events following a persistent and abundant rainy season. How will we monitor vineyards differently this summer because of the additional winter rains? CWM: Our approach to monitoring is to ensure a balanced ecosystem. It is a key foundational goal which drives all vineyard activities. 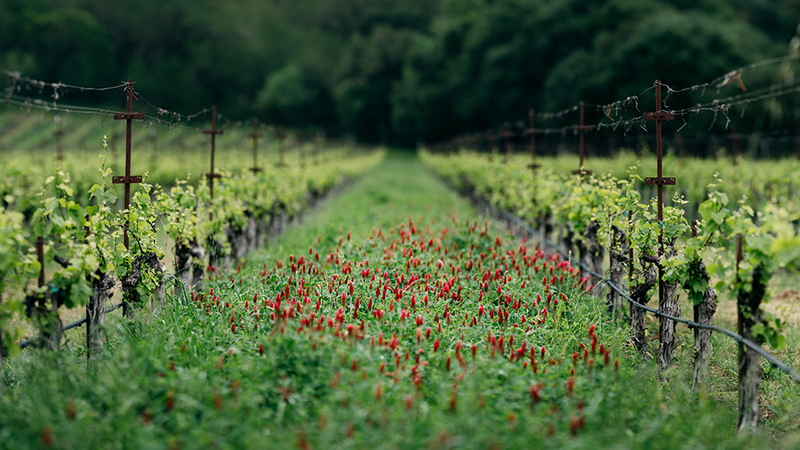 The additional winter rains will create a shift in this balance, and during the summer months we focus on identifying the outliers to help guide our vineyard activities. We look forward to discovering what the 2019 season brings. What enhancements are taking place in our Freestone estate vineyards this year? JB: Multiple Pinot Noir blocks are being converted from cane pruning to cordon in order to increase vine uniformity and fruit quality. We are also installing cross-arms into the trellis to increase airflow and sunlight penetration into the interior canopy resulting in improved phenolic development throughout the season. We look forward to an outstanding growing season!